We recently did a Chicago Blackhawks’ theme for a Bar Mitzvah celebration party in Evanston, Illinois. Marlee and her son, Jake came to us for centerpieces for Jake’s Bar Mitzvah. 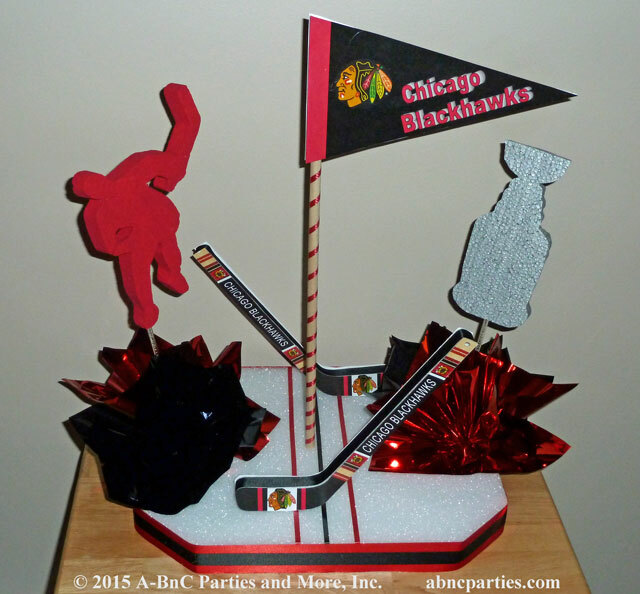 Jake is a great Chicago Blackhawks fan and wanted the team and the Stanley Cup to be the theme for his Bar Mitzvah. 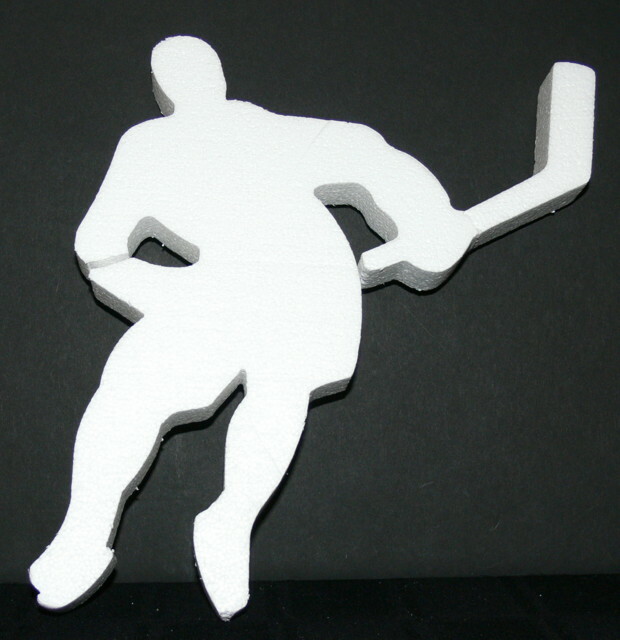 We left the Styrofoam base unpainted to simulate the ice on a hockey rink. Red and black ribbons down the middle of the “ice” depicted the zones. The bottom base was shaped to somewhat resemble a hockey rink. A hockey player cut out and of course a Stanley Cup trophy cut out were great theme additions and prominently displayed on the centerpiece. I made a sample centerpiece. Marlee and Jake came to see it. They liked the centerpiece as presented to them and asked for no additions or changes. 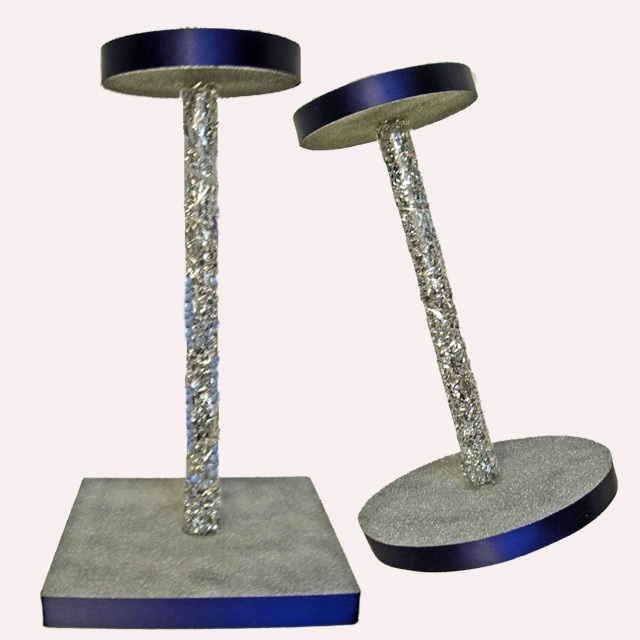 This is the centerpiece that Jake would have for his Bar Mitzvah. When Marlee and Jake came to view the sample hockey centerpiece they also decided there should be two special centerpieces for the room. These would be where they kids would eat their lunch. 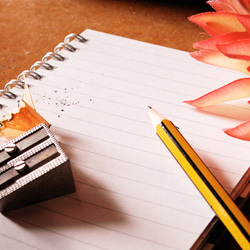 We designed a centerpiece to coordinate with the original centerpiece. We just made it taller. I used a flexible plastic tube to raise a smaller base above the bottom base. Larger hockey player cut outs and Stanley Cup trophy cut outs were used to adorn the bottom bases. 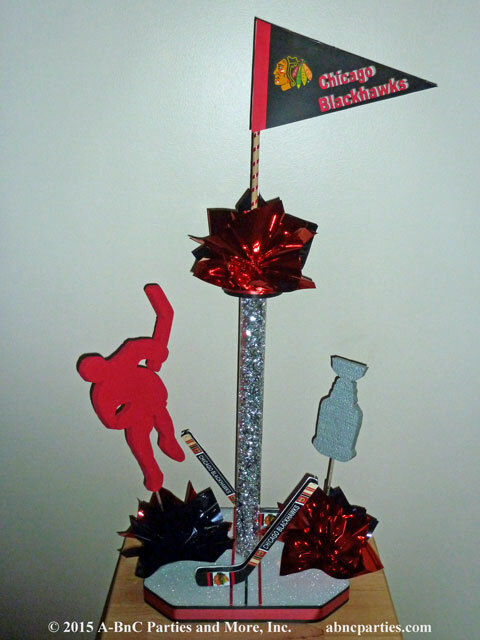 A larger custom designed Blackhawks’ pennant was used for the top of the tall centerpiece. Jake did wonderfully at his Bar Mitzvah and everyone loved the centerpieces. Marlee said that people were asking to take the centerpieces home. That is music to our ears and a goal we strive for with each party we help our friends celebrate. 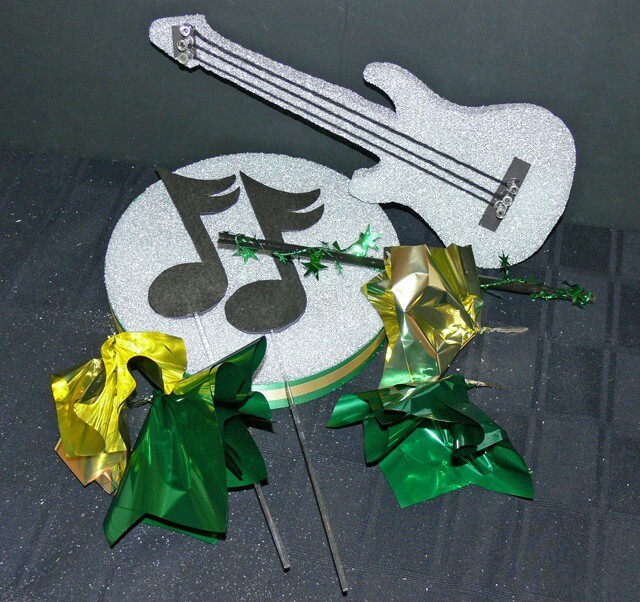 Check out our other Web site pages for more ideas on custom party centerpieces and for our do it yourself centerpieces.